Baylor>Robbins College of Health and Human Sciences>Faculty & Staff>Faculty Directory>Paul Fillmore, Ph.D.
Dr. Fillmore joined the Baylor faculty in Fall of 2015. 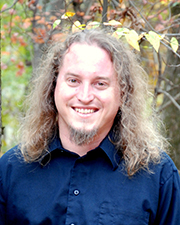 Prior to coming to Baylor, he completed a post-doctoral fellowship and served as research faculty at the University of South Carolina (2010-2015) and served as an adjunct faculty member at Vanguard University (2008-2009). Dr. Fillmore is an auditory cognitive neuroscientist by training, with expertise in adult neurogenic communication disorders. Dr. Fillmore has taught courses in areas such as aphasia, cognitive communication disorders, research methods, neuroimaging analysis, biological psychology and statistics. Dr. Fillmore’s primary areas of specialization are in neurogenic communication disorders and brain-based research methods. His research interests include the neural correlates of speech and language processing (particularly the interactions between bottom-up and top-down processing in speech comprehension), and applications of cognitive training and neuromodulation techniques to improvment of speech and language function. Decker, S., Fillmore, P. & Roberts, A. (In press). Coherence: The Measurement and Application of Brain Connectivity. NeuroRegulation. Roberts, A.M., Fillmore, P. & Decker, S.L. (2016). Clinical applicability of the test-retest reliability of qEEG coherence. NeuroRegulation. 3(1): 7–22. http://dx.doi.org/10.15540/nr.3.1.7. Venezia, J., Fillmore, P., Hickok, G. & Fridriksson, J. (2016). Perception drives production across sensory modalities: A cortical network for sensorimotor integration of visual speech. Neuroimage. 126:196-207. doi: 10.1016/j.neuroimage.2015.11.038. Fridriksson, J., Fillmore, P., Guo, D. & Rorden, C. (2015). Broca’s aphasia is caused by damage to Broca’s and Wernicke’s areas. Cerebral Cortex. 25(12):4689-96. Fillmore, P.T., Richards J.E., Phillips-Meek, M.C., Cryer A. & Stevens M. (2015). Stereotaxic Magnetic Resonance Imaging Brain Atlases for Infants from 3 to 12 Months. Developmental Neuroscience. 37(6):515-532. doi:10.1159/000438749. Guo, D., Fridriksson, J., Fillmore, P., Rorden, C., Yu, H., Zheng, K. & Wang, S. (2015). Automated lesion detection on MRI scans using combined unsupervised and supervised methods. BioMed Central Medical Imaging. 15-50. doi:10.1186/s12880-015-0092-x. Fedorenko, E., Fillmore, P., Smith, K. & Fridriksson, J. (2015). The Superior Precentral Gyrus of the Insula does not appear to be functionally specialized for articulation. J Neurophys. 113(7):2376-82. doi:10.1152/jn.00214.2014. Fillmore, P., Phillips-Meek, M. & Richards, J. (2015). Age-specific MRI brain and head templates for healthy adults from 20 through 89 years of age. Frontiers in Aging Neuroscience. doi:10.3389/fnagi.2015.00044. Basilakos, A., Fillmore, P., Rorden, C., Guo, D., & Fridriksson, J. (2014) Regional white matter damage predicts speech fluency in chronic post-stroke aphasia. Frontiers in Human Neuroscience. doi:10.3389/fnhum.2014.00845. Richardson, J.D., Fillmore, P., Datta, A., Truong, D., Bikson, M. & Fridriksson, J. (2014). Toward development of sham protocols for high-definition transcranial direct current stimulation (HD-tDCS). NeuroRegulation. 1(1), 62-72. doi:10.15540/nr.2014.1.1.62. Bonilha, L., Nesland, T., Rorden, C., Fillmore, P., Ratnayake, R.P., Fridriksson, J. (2014). Mapping remote subcortical ramifications of injury after ischemic strokes. Behavioural Neurology. doi:10.1155/2014/215380. Magnusdottir, S., Fillmore, P., den Ouden, D.B., Hjaltason, H., Rorden, C., Kjartansson, O., Bonilha, L., & Fridriksson, J. (2013). Damage to left anterior temporal cortex predicts impairment of complex syntactic processing: A lesion-symptom mapping study. Human Brain Mapping, 34(10): 2715-23. Rorden C, Hjaltason H, Fillmore, P, Fridriksson J, Kjartansson O, Magnusdottir S, Karnath HO (2012). Allocentric neglect strongly associated with egocentric neglect. Neuropsychologia, 50(6):1151-7. Richardson JD, Fillmore, P, Rorden C, Lapointe LL, Fridriksson J. (2012). Re-establishing Broca's initial findings. Brain and Language, 123(2):125-30. Hsieh, I-H, Fillmore, P., Rong, F., Hickok, G. & Saberi, K. (2012). FM-selective networks in human auditory cortex revealed using fMRI and multivariate pattern classification. Journal of Cognitive Neuroscience, 24(9):1896-907. Fridriksson J., Richardson J.D., Fillmore, P. & Cai B. (2012). Left hemisphere plasticity and aphasia recovery. Neuroimage. 60(2), 854-63. Gage, N.M, Eliashiv, D.S., Isenberg, A.L., Fillmore, P.T., Kurelowech, L., Quint, P.J., Chung, J.M. & Otis, S.M. (2011). Rethinking clinical language mapping approaches: Discordant receptive and expressive hemispheric language dominance in epilepsy surgery candidates. Journal of Clinical Neurophysiology, 28(3), 278-288. Kemp, A.S., Fillmore, P.T., Lenjavi, M.R., Lyon, M., Chicz-DeMet, A., Touchette P.E. & Sandman, C.A. (2008). Temporal Patterns of Self-Injurious Behavior Correlate with Stress Hormone Levels in the Developmentally Disabled. Psychiatry Research, 157: 181-189.